The San Fernando Valley chapter of the JACL is pleased to honor five talented college and college-bound students with scholarships to support their academic and social justice organizing pursuits. 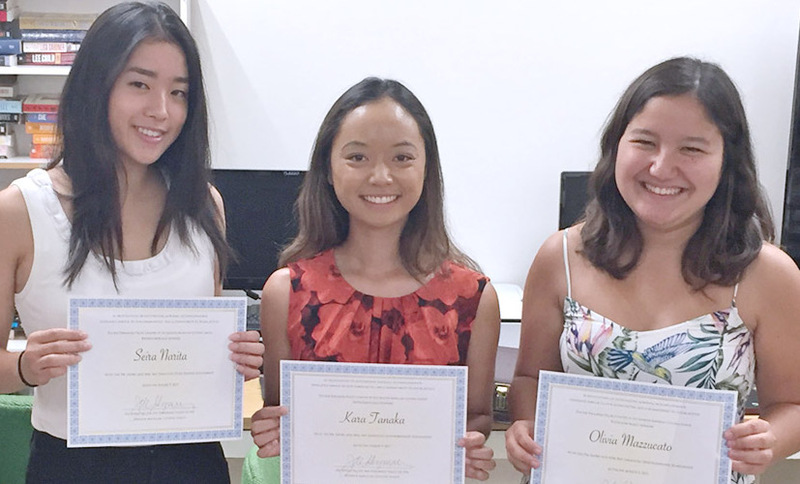 Seira Narita, who is headed to the University of California, Davis, in the fall, received the Dr. Sanbo and Mrs. Kay Sakaguchi Graduating High School Scholarship. Olivia Mazzucato (University of California, Los Angeles), Kara Tanaka (Santa Clara University) and Nova Weng (University of California, Los Angeles) received the Dr. Sanbo and Mrs. Kay Sakaguchi Undergraduate Scholarships, while Dean Caudill (University of California, Berkeley) received a chapter undergraduate scholarship. The chapter recognized the breadth and depth of each student’s scholastic achievements and level of engagement with their school and larger community. Each recipient is also well-versed in contemporary issues facing Asian Americans such as media representation, LGBTQ rights and immigration politics. They are currently (or aspiring) journalists, artists, musicians, veterinarians and policymakers. The Dr. Sanbo and Mrs. Kay Sakaguchi Scholarships are funded by a longtime chapter supporter and named for pillars of the San Fernando Valley Japanese American community. The scholarship committee specifically awards students with interests in civil rights and community service. For more information about the scholarships, visit the chapter’s website (http://sfvjacl.weebly.com/scholarships-and-internships.html).